“Spring daylights.” Park sweeper, c. 1910. 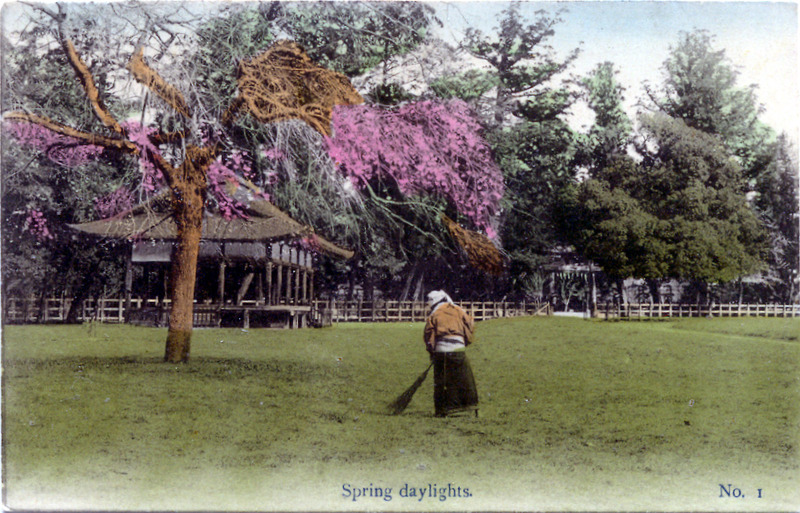 “In Japanese terms the apparently simple task of cleaning, whether of an external environment such as a park, or a personal one such as one’s face, can incorporate a whole series of metaphors which have a spiritual significance which is, in turn, related to the conduct and nature of everyday life. “… [T]he importance of work, in this respect, was in the performance of an action rather than its practical ends, and that, for those of us in the garden, or at least the lucky five with brooms, the central issue was of going through the motions, with a ritual performance that stated both to themselves and to all around that they were doing the right thing in the proper way at the correct time.